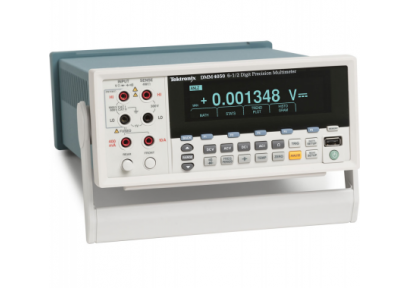 With 6.5 digit resolution, the Tektronix DMM4050 and DMM4040 multimeters enable you to measure volts, ohms and amps with a basic V DC accuracy of up to 0.0024. Integrated frequency, period, capacitance and temperature measurements mean you can make a wide range of measurements with one instrument. You can also monitor and record measurements over time or environmental ranges and view statistical values to see how your circuit's performance is changing. And, dedicated front-panel buttons provide fast access to frequently used functions and parameters, reducing set-up time. The DMM4050/4040 multimeters provide the feature-rich tools and precision you need for your most demanding measurements.